When I was a little kid, my dad brought home some croquettes from the supermarket once. They weren't salmon and vegetable...they were potato and something I think. But anyway, that doesn't matter. And honestly, I don't even remember what they tasted like, but I must have liked them because I remember asking for them more than once. I had never heard of a croquette before, but the way I remembered the name was that it was similar to the sound a toad makes: "croak." So the next day I used my (faulty) memory device and asked my dad for another "ribbit." Silly the things you remember and the things you don't. And one thing I'm not soon to forget is the fishiness of the last salmon product I reviewed or that of the worst salmon product I've ever had. But fortunately for me, this salmon dish is the exact opposite of those fishy salmon dishes. 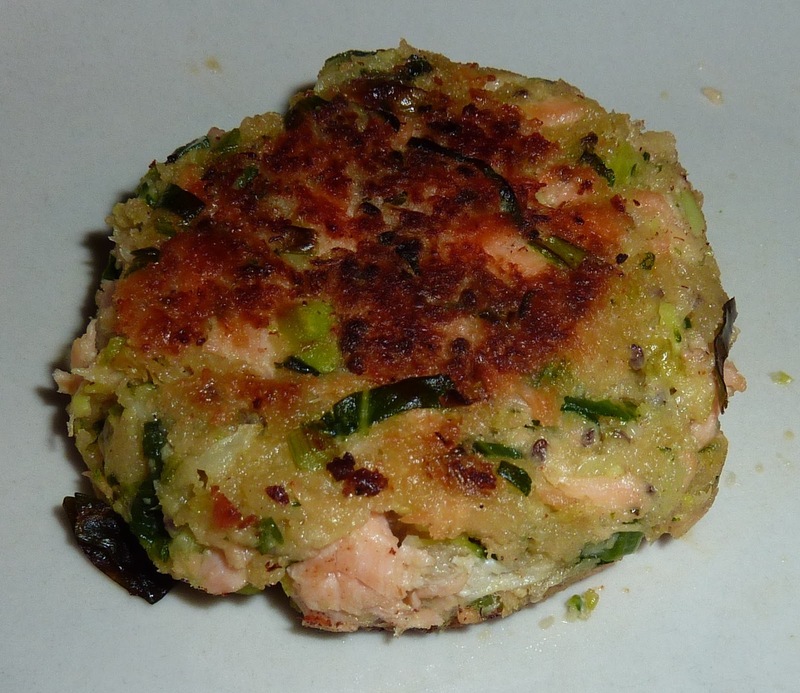 It still tastes like salmon, but with virtually none of the bad kind of fishiness. That is to say, it was quite tasty. I pan fried mine on the stove top with some coconut spray until they were golden brown on the top and bottom. As per the instructions, I thawed them in the microwave for about 45 seconds prior to the actual cooking. I still think they needed a couple extra minutes in the pan—maybe because my microwave is old and weak. But I trusted my eye instead of following the instructions to the letter, and I wasn't disappointed. They were slightly crispy on the outside and all the ingredients were nice and soft—almost like crab cakes—in the middle. Flavor-wise, everything was well balanced and delicate. There was a good bit of that high-quality salmon, and it was definitely the main attraction, although the edamame, kale, broccoli, and chia seeds gave it a nice veggie base, with subtle notes of nuttiness. At first, I thought $5.49 was a bit steep, but if you compare this product to an appetizer at a restaurant, it's not a bad deal. And yes, these croquettes are indeed restaurant-quality, if you ask Sonia or me. The wifey was just as impressed as I was. She really enjoyed this salmon, but also really loved this particular medley of veggies. Double fours here. Sauté onion in oil until tender. Add to salmon and mix. 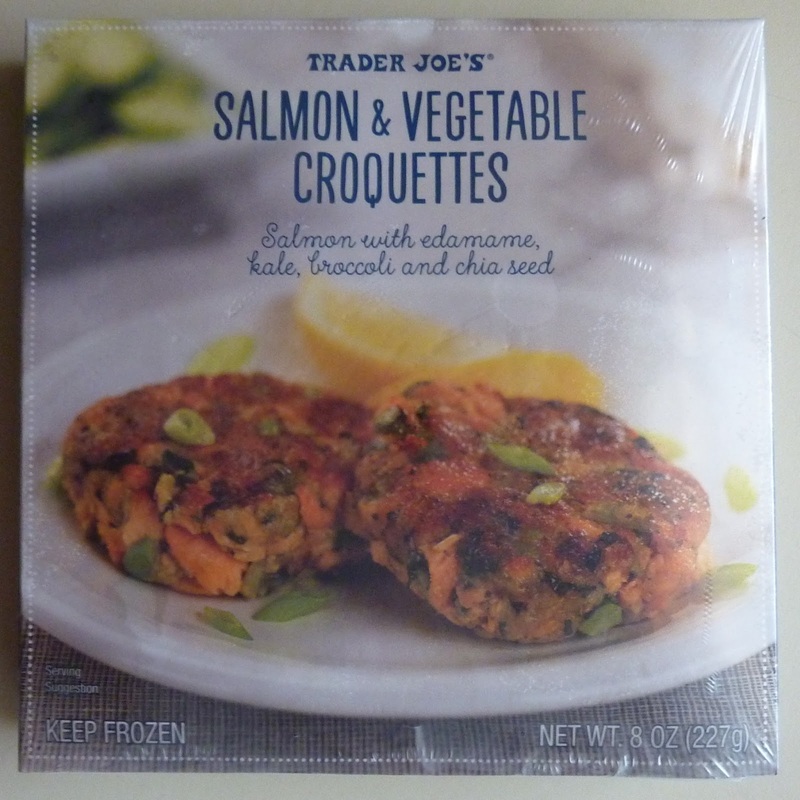 One would have to add the edamame, kale, broccoli, and chia seeds to make these even comparable to the TJ's product.
" it was similar to the sound a toad makes: "croak." So the next day I used my (faulty) memory device and asked my dad for another "ribbit." "